Travelling is not just taking the flight and off to your destination. You can turn your journey into the adventure with proper planning and management. There are a lot of things that travellers have to be considered in advance for a peaceful journey. A little planning and smart use of money helps you to enjoy a budget-friendly trip. Most of the people are stressed about the safety of their vehicle, accommodation, flight and packing. So, pre-planning is the only solution that makes your journey hassle-free and smooth. Some people do not care about the little things like shopping, packing and what to wear during the flight that keeps them comfortable during their flight. They thought that they can easily overcome these issues while travelling alone. But, it is very important to know what to wear during your flight. It all depends on you that how you make your holiday exciting or exhausting. Here are the tips that help you to be comfortable during your flight. What Not To Wear On A Plane? 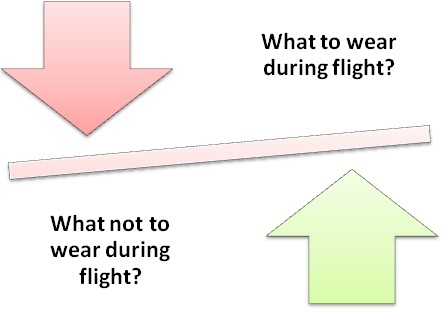 What To Wear During Your Flight? The rules of in-flight fashion are different from those on the ground. So, update yourself with the latest travel tips and make your journey comfortable.